Eating disorder clinicians seek practical solutions to highly challenging treatment situations that at times leave them feeling as emotionally challenged as the patients they treat. This is the first book of its kind to provide support, direction, clarity and optimism to an army of beleaguered clinicians. Merging technical skills with personal know-how, Doing What Works offers a coherent, sequential and systematic treatment package that structures care from pre-diagnosis to recovery. In describing what and how to do “what works,” reader-friendly strategies and holistic guidelines bring together science and human personality, protocols and art, evidence-based research with practicable clinical applications to provide a fully integrative approach to care. Doing What Works facilitates collaborative and healing human connections that sustain both patient and practitioner through the toughest of passages; it provides therapists the permission, incentive, vision and confidence they need to become self-starters within a demanding treatment process---and to help their patients do the same. This book offers the unique opportunity for the multi-disciplinary treatment team to better understand and facilitate each others roles, to “look over each other’s shoulders” in facilitating enhanced collaboration. 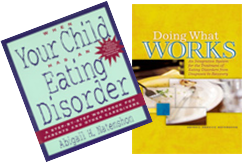 Doing What Works is a “must read” not only for therapists, nutritionists, and medical doctors, but also for patients as well as parents and families, who need to join forces with treating professionals to most effectively mentor their own, and/or their child’s, recovery. Therapists tend to consider complex, intractable and potentially fatal eating disorders as the hard-to-treat stuff of treatment “burn out.” Many clinicians simply refuse to treat these disorders and of those who do, most have only limited success. This optimistic, “can do” book is first of its kind to speak to a professional audience in layman’s terms about what, when, and how to do “what works” in treating these disorders.” Natenshon states that it is within all of capacities to handle these cases successfully. The author’s voice is the single most significant ingredient in creating an engaging and readable book. She evokes an active and engaged “dialogue” with readers, speaking their concerns, anticipating their questions, and remains ever responsive to their needs. Each chapter of this book is capable of standing on its own, inviting all readers, be they seasoned or novice, to find meaning and relevance where they seek it. This book is unique in combining evidence-based techniques with the poignancy of mindful relatedness on the part of the practitioner in sustaining the healing connection with the patient. Natenshon describes practitioners as “listeners first”- listening to hear the client, listening to learn, and to permit the patient to discover her own self. “To best hear what is spoken, as well as what yet remains unsaid, therapists must quiet their own internal voices, even while keeping one ear always open to one’s own core self. By silencing connections with one’s own authentic self, treaters risk the loss of connection with the patient and the therapeutic moment, forfeiting an ideal opportunity to role model for their patients. A source of professional training and virtual consultation “between two covers,” benefiting professionals and families alike, Doing What Works builds confidence and offers permission for therapists to rely more heavily on a developing instinct and educated judgment… the very same dynamic we ask of our recovering patients. Special topics include the unique aspects of diagnosis, the requirements for a versatile use of the practitioner's self in treatment, co-morbidity, childhood eating and feeding disorders to include picky eating syndrome and sensory integration disorder, and the significance of neuro-scientific research on the treatment of eating disorders with a focus on the impact of brain plasticity on creating remediating movement and changes towards recovery. Contrary to current best-practice theories that focus principally on evidence-based theories, experience has proven that the therapeutic relationship and the therapist’s use of self in determining the quality of the human connection becomes a most significant consideration in clinical practice. 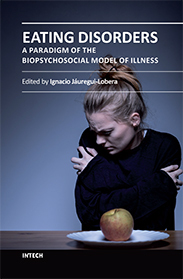 Despite the research available about eating disorders, there has, to date, been no single book that focuses primarily on the application of evidence-based science to clinical practice. Evidence based theories by themselves, in the absence of human connection and the facility to apply them, are not sufficient to turn the tide on an eating disorder. As a result, too many lethal eating disorders remain undiagnosed or inadequately treated. This book is the first to explain in a reader-friendly manner what to do, and how to do it, when face to face with the ED patient. Loaded with case studies, practical tips and strategies, Doing What Works speaks to novice and seasoned practitioners alike. No other book comprehensively and systematically shepherds the eating disorder treatment process forward, step-by-step, from pre-diagnosis to recovery. With a unique focus on the therapist’s use of self, the book offers a substantive discussion about the phenomenon that so many therapists who treat ED have personally experienced them, potentially giving rise to counter-transference issues that demand on-going self-awareness, appraisal and insight. In offering a unique focus on integrative treatment approaches, this book incorporates atypical and holistic mind/body techniques “that work,” with a forward look to the potential of the role of brain plasticity in developing twenty first century treatments. This work is unique in facilitating the practitioner's understanding and appreciation of the role of brain plasticity in evoking and sustaining change in healing a disorder whose pathology spans all spheres of life function and development, and all realms of behavior, cognition and emotion. Understanding of the potential of brain plasticity to enhance and sustain recovery efforts can become a significantly optimistic and motivational factor for both patient and clinician. Though the book is geared to professional readers, this book is a “must read” for patients and parents of children with ED; as VIP members of the treatment team, they will discover this an invaluable resource in understanding what treatment is about and what they must come to expect and demand from the treatment process in advocating for their own and their children’s care. Contact me if you would be interested in obtaining professional consultation.